A great clash of civilisations is underway. From the east and north come the Merduks of Ostrabar, having overthrown the Holy City of Aekir and now prosecuting the invasion of Torunna. Stymied before the guns of Ormann Dyke, the Merduks have now outflanked the fortress through a seaborne invasion and threaten to destroy its defenders from the rear. From the west an army of the Fimbrian Republic marches to Torunna's relief, but the ultimate fate of the kingdom rests in the hands of a lowly cavalry colonel and his ragtag troops. The heretic kings Abeleyn of Hebrion and Mark of Astarac have regained their thrones and thrown back the forces of the Himerian Church, but a greater danger is now unveiled as a single ragged ship flees out of the Great Western Ocean, bearing stories of madness and death in a new and untamed land. 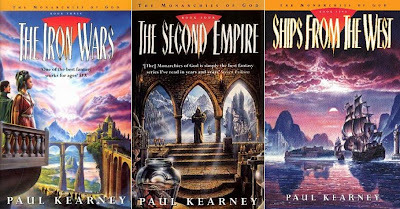 Century of the Soldier collects together the latter three volumes of Paul Kearney's Monarchies of God series: The Iron Wars (1999), The Second Empire (2000) and Ships From the West (2002), and concludes the series in a strong, if not flawless, manner. The structure of this omnibus is different to that of the first. The Iron Wars and The Second Empire form one long narrative as the Ramusian and Merduk armies clash for dominance of eastern Normannia, civil conflict breaks out within the Ramusian Church over certain revelations about its origins and as Abeleyn battles to hold his throne, whilst Ships From the West is effectively a sequel to the rest of the series, set seventeen years further down the line when the threat glimpsed during Richard Hawkwood's adventures is finally unleashed in full fury. The success of this structure has been hotly debated over the years, with a general feeling that Ships From the West is not as strong a conclusion as may be wished. Before reaching that point, the third and fourth books are a triumph. Whilst writing them Kearney took part in massive American Civil War re-enactments in the USA and this informs the writing of the several huge battle sequences in these volumes, among the most impressively-described ever achieved in the epic fantasy subgenre (the Battle of the North More, the King's Battle and the conflagration at Armagedir vastly outstrip any of the battles in A Song of Ice and Fire or the Malazan series in their vividness). 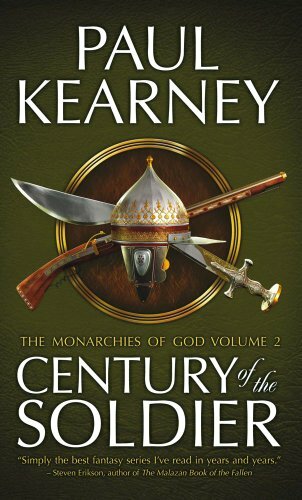 Yet Kearney is implacable in his refusal to glorify warfare. It is depicted as brutal and horrific, particularly a jaw-dropping sequence in the fourth volume when Kearney nails the problems faced by commanders when a small Torunnan force has to stand by outside a town being sacked by a large enemy formation whilst awaiting reinforcements. It's a horrible and disturbing scene, dropped in as an ugly reality check amongst the impressive cavalry charges and roaring artillery exchanges, and works very well. His character-building is also impressive, with Corfe becoming a particularly well-realised figure. His extremely rapid rise from ensign to colonel and to higher rank is on the fast side (although, that said, Napoleon's rise from artilleryman to general was fairly meteoric as well) but in the context of the story it is plausible. The notion of a man stripped of all the things that connects him to the world save his abilities in war becoming a great general is a familiar one, backed up here by a tragedy which the reader is aware of long before the characters, leading to a powerful conclusion that should feel contrived, but doesn't thanks to the circumstances that leads the characters to that point. A bigger problem in these two volumes is that events in the west take not so much of a back seat as an extended vacation, with Hawkwood and Murad's appearances reduced to mere cameos despite the gravity of the new threat from the west. However, this does resolutely focus the narrative on Corfe's story, to its benefit. 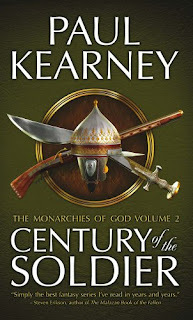 The final volume of the series has been criticised over the years for a number of reasons (most stringently by the author himself), and Kearney has addressed some of these issues through around 5,000 words of new material and rewrites. The fates of several characters left unresolved in the original book are now made clearer (most notably Avila and Abeleyn) and there are some tweaks here and there which clarify certain points. However, the biggest problem with the book, namely the extreme rapidity of the passage of events and the rushed feeling of the book (despite their short lengths by epic fantasy standards, the previous four books never felt rushed, whilst the fifth does), remains an issue, as does a potential plot hole regarding the fact that the enemy's Achilles heel as been extremely well-known since the first volume but is not militarily exploited until quite late in the day here, despite the seventeen years of preperation for the conflict. That said, whilst the fifth book does not fulfil its true potential, it is also hardly a disaster of the same magnitude as Greg Keyes' The Born Queen (which wrecked the series almost beyond redemption) or Alan Campbell's God of Clocks (which rendered the entire trilogy pointless). The character and story arcs are brought to satisfying, if exceptionally bloody, conclusions and there is a dark irony in the conclusion which is still grimly amusing. Century of the Soldier (****½) is an epic fantasy book about war, the reasons for it, what it costs people and the fact that its resolution is rarely just or dramatic. The final volume remains a little undercooked, although Kearney's rewrites do alleviate some of the issues, but overall this is a worthy conclusion to the story begun in the first omnibus. The book is available now in the UK and USA. Your Paul Kearney reviews have made me immensely curious about reading his works. The local library doesn't have it, but they do have "The Mark of Ran." Have you read that one? Yes, and it is very good. I have reviewed the second book in that series, THIS FORSAKEN EARTH, on the blog as well. 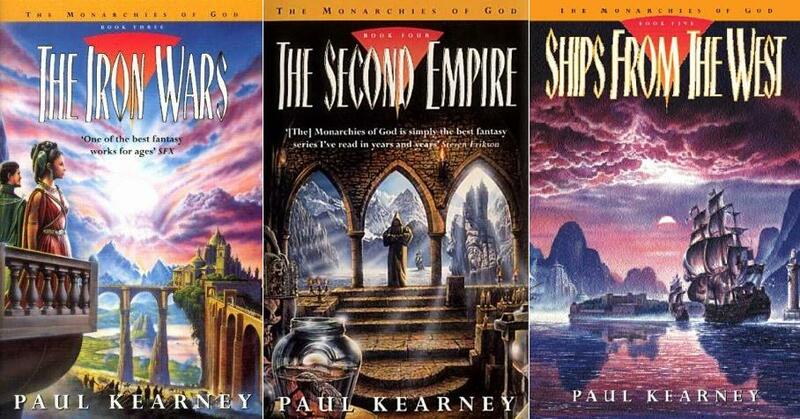 Unfortunately, Paul's then-publishers dropped the series due to poor sales of the second book (which may have been caused by the title being switched just a few weeks before release and a lack of advertising), which was harsh but understandable from a business POV, but they've also inexplicably refused to give up the publishing rights. Once the rights expire, Solaris will republish those books along with the conclusion, STORM OF THE DEAD. My copy of Hawkwood and the Kings arrived yesterday, can't wait to start it this weekend. I'm definitely going to have to read these books. This is the type of epic fantasy that I love. On a side note, can you shed some light on why The Born Queen almost ruined Kingdoms of Thorn and Bone? I read all books in the series except that one, but it got such terrible reviews that I'm not terribly interested in reading it. THE BORN QUEEN felt very rushed and like the writer had gotten bored of the series and wanted to wrap it up so he could move onto his next exciting project (although given that his next book was an ELDER SCROLLS tie-in, maybe not). Lots of characters acted out-of-character and things happened purely for plot convience rather than arising out of the characters and situation. It was, boiled down to the basics, a very half-arsed effort. Ok so I've just finished the series last week and after a few days of mulling it over have come back, re-read your reviews and i pretty much have to agree. It's a frickin' AWESOME series let down by an extremely rushed final novel with an almost deus ex machina feel to it (a hidden pass? Come on). I also agree it wasn't quite as much a travesty as Keyes' Born Queen which turned a really fun and interesting series into a farcical romp through a pile of horseshit. Despite that I am recommending it to all my fellow fantasy lovers because, quite frankly, the first 4 novels are up there with the absolute best in the field. Thanks again for a great recommendation! Did George R.R. Martin create wookies? Steven Erikson playing the Game of Thrones?